My experiences in New York City reveal that one might have to be in a situation to see its holes. In 2007, I filed a DBA (doing business as) under Civic Gaps, an initiative to analyze and record gaps and system failures in the city’s everyday life based on personal observations. I became familiar with the HDFC by living in one, educating myself and researching elements that didn’t make sense (either in practice or from the By-Laws). It is from this perspective, or the indenpendent research attached to personal observation, that I am writing to you now, I would like to share my views on the proposed regulatory agreement for HDFCs. I understand full well that it is the responsibility of government officers to make policies; therefore, this (as with any other agreement) is done by “the experts.” However, I believe that it is only at the junction of “the experts” and “the experiential” that policies can make total sense for the people. I am writing this now because “the experiential element” does not seem to have been taken into account. It appears that the agreement has been made only from “the experts’” approach, not from the perspective of those living in the HDFCs. There are gaps, contradictions of purpose and several elements that have been overlooked. The proposed HDFC agreement, as written, will have negative implications to the people living under it. And I am not talking about losing equity – I am talking about the breakdown of the equilibrium of a community and the impact on its members on a personal level. Oversight 1 – The 270 Nights’ Rule overlooks those who travel for work or for family obligations. Keep primary residency and sublet the same as in rent stabilization: 183 days, not 270 nights and 2 years every 4, not 18 months every 5 years. Gap 1- Include a provision to extend the current HPD policy of paying maintenance by square foot (applied in 2003 to all HDFCs). Gap 2 – A provision that brings stability to the cooperative and sets the maximum on maintenance increases and that will prevent luxury items being mandatory, even when approved by majority. Gap 3 – Consider the substitution of the proposed 30% flat flip tax for a sliding scale for flip taxes. Oversight 2 –Exclude a provision about putting a cap sale price on apartments if mandatory flip taxes % is kept. No double restriction on the sale, on the price and on the profit. Oversight 3 ––Exclude any provision limiting the power of the board. Only the Board should approve sales. Oversight 4 – Switch perspectives and introduce the agreement from the positive point of view: offering it to those who want to join. While the observations in the coming paragraphs are not based directly on the proposed regulatory agreement draft by HPD (because it has not been widely distributed nor made available to the public at the time of this writing), I have read the PDF document titled Preserving At-Risk Affordable Home Ownership: HDFC Coops and Our Community Manhattan Borough Board Meeting July 21st, 2016 and the reference video of the presentation by you (Deputy Commissioner for Asset and Property Management, Anne Marie Hendrickson): Preserving At-Risk Affordable Home Ownership: HDFC Coops and Our Community that took place July 21st, 2016, at the Manhattan Borough Board Meeting that was available at the following link: http://manhattanbp.nyc.gov/html/borough_Board/borough_Board.shtml (now deleted). Most of what I learned lately about prospective HDFC reform came from NYC HDFC. I also attended most meetings by other different groups, including UHAB and Community Board and other meetings over a three-year period. Oversight 1 – The 270 Nights’ Rule overlooked the life of those who travel for work or family obligations. Keep primary residency and sublet as in rent stabilization: 183 days, not 275 nights and 2 years every 4, not 18 months every 5 years. This new agreement introduces additional restrictions in primary residency. The “Sleeping in the unit for at least 270 nights a year”, in practical terms, implies losing the apartment for having a boyfriend/girlfriend or a freelance job. Also, an important part of the HDFC´s occupants are second and first generation immigrants who travel to other countries to see their families and that will not longer be allowed to live in an HDFC. The 270 nights a year rule also disregards current laws in rent stabilization (applying those of short rentals) and overlooks the right of freedom from arbitrary interference with privacy and the freedom of movement by the United Nations. The 270 nights rule profile residents in HDFC, to those with stable full time jobs (such as municipal workers) and who live with their domestic partner but is it the government’s role to select the profile of the residents of affordable housing? If one has a partner that is not domestic (one who is not living with his/her partner) and goes to sleep with the partner twice a week, with the new regulatory agreement, one will lose the home. If one has several employees and works a couple of days a week (e.g., teaching), or if one travels to obtain clients for his/her company and spends even as little as two nights a week sleeping in a hotel, with the new regulatory agreement, one will lose the home. If one is retired and wants to spend some time with family and visit for three months a year, or if one is an immigrant who visits family abroad for three months a year, with the new regulatory agreement, one will lose the home. In addition, the “sleeping in the unit for at least 270 nights a year” policy implies that one cannot have an active sexual life (if not living with the partner) and that one cannot have a complex labor life. Why these additional requirements when there is already in place a policy for primary residency? With the “sleeping in the unit for at least 270 nights a year,” an HDFC resident will have to choose between losing the apartment of having a boyfriend/girlfriend or a freelance job. The “sleeping in the unit for at least 270 nights a year” by displacing retirees who travel, immigrants who visit their families, single who don’t sleep at home every night, as well as freelancers who have to travel to work and any other form of liberal living, seems to be designed with a type of person in mind, married (domestic partner) and with a stable job. But is it the government’s role to select the profile of the residents in affordable housing? On several occasions in the video, “rent stabilized” is mentioned as a reference. But then, this agreement redefines what primary residency is and what the subletting terms are. There are clear rules about primary residency and subletting in rent stabilized apartments (183 days and 2 years every 4). “Sleeping in the unit for at least 270 nights a year” is currently applied for allowing short rentals in private residencies in individual states but no short rental is allowed in New York. Why use that here? “Sleeping in the unit for at least 270 nights a year” is an additional requirement to primary residency in those states that allows short rentals in private residences. And the allowance of short rentals for only 90 days is insurance of nine months staying in the house. In a nutshell, the 90 day rentals are a bargain for an extra 90 days for the resident in the home. But the additional requirement of 270 days in HDFC is imposed with no contract offered. What is the point of imposing an additional requirement when there is no added benefit for the resident? “Sleeping in the unit for at least 270 nights a year” is not in the lines of rent stabilization regarding primary residence, but in the lines of additional regulation for primary residents in exchange for short rental allowance. This adds confusion to the principles of this reform. What is the point of applying short rental requirements to residents who are not short-renting their homes? “Sleeping in the unit for at less 270 nights a year” brings confusion: What is being regulated: renting for short rentals or occupying the home that one buys or already has? The primary residency requirement for rent stabilizes apartments name “days,” but this new policy is talking about “sleeping” and “nights.” Please notice that the language “sleeping” and “nights” is more private than the language used in the rent stabilized regulations (occupying a house for “days”). In a private residence that is trying to be a short rental, interference by the authorities is expected. The frame for the interference of privacy can be given up in favor of the commercial transaction. But in a private residence that is not intended to have an additional business (i.e., short rental), the interference by the authorities is not expected and can turn into authoritarianism. This confusion of intention raises another issue, which is the frame for the interference of privacy. Freedom of interference with privacy might not apply in other special circumstances. One might lose his/her civil rights because one is a prisoner during authoritarian regimes. Reporting home at night is also common during dictatorships. For instance, during the Nazi regime in Germany, individuals in targeted groups and minorities had to report home at night. Prisoners on parole have to report home at night, as prisoners lose their freedom and certain civil rights because they are “slaves of the state.” But people living in HDFC are residents, not prisoners, and we are in a democracy, not under an authoritarian regime. On what basis, in a democracy, should adults be expected to have to report to authorities when they are home at night? The overlooking of important implications is making this agreement appear as something forceful. The video and PDF mention that many people are subletting their apartments all the time, and that is an issue. Making sure that the rules are followed instead of creating more rules as a punishment for all can solve the problem. It is clear that when things get out hand, the equilibrium needs to be reset, and that is specifically the function of government. However, if the constraints are too tight, the equilibrium will be broken again by its opposite: excessive punishment and repression. This creates resentment, in the long run, which starts a new cycle of different issues. To say that HDFC coop residents must be the primary resident is one thing and to redefine what is primary residency (when they have similar regulations to those of rent stabilized apartments) is another and is overregulation. Perhaps the proponents of the “sleeping in the unit for at least 270 nights a year” policy simply want to create a profile for the perfect resident for an HDFC (and not seeking repression with overregulation). But again, the way that one lives one’s life is not something the government should be regulating, and shareholders should not be profiled based on lifestyle. Please use the criteria for rent stabilized apartments for primary residency and sublets for HDFCs. Please delete the “sleeping in the unit for at least 270 nights a year” policy and include the current Rent Stabilized policy of “occupying the apartment for at least 183 days.” Substitute the 18 months every 5 years for the current 2 years every 4 years. Article 3, the first cornerstone of the Declaration, proclaims the right to life, liberty and security of person –a right essential to the enjoyment of all other rights. This article introduces articles 4 to 21, in which other civil and political rights are set out, including freedom from slavery and servitude; freedom from torture and cruel, inhuman or degrading treatment or punishment; the right to recognition everywhere as a person before the law; the right to an effective judicial remedy; freedom from arbitrary arrest, detention or exile; the right to a fair trial and public hearing by an independent and impartial tribunal; the right to be presumed innocent until proved guilty; freedom from arbitrary interference with privacy, family, home or correspondence; freedom of movement and residence; the right of asylum; the right to a nationality; the right to marry and to found a family; the right to own property; freedom of thought, conscience and religion; freedom of opinion and expression; the right to peaceful assembly and association; and the right to take part in the government of one’s country and to equal access to public service in one’s country. There is a “gap” in the application of the policy “pay maintenance by square feet” that affected all buildings converted between 1992-2003. From what I have know, the prospective regulatory agreement doesn’t include a provision to introduce maintenance that is calculated by square foot, which is the current HPD policy for paying maintenance. HPD added the “pay maintenance by square foot” in 2003 and affected buildings that signed the regulatory agreement after that date. However, this policy wasn’t applied retroactively to the buildings that were converted from the beginning of the program (before 2003) and that are currently paying maintenance by “room count” – the vast majority. Who is affected? How many buildings are paying by “room count” and how many by square foot? There are 1074 HDFC buildings; out of those, only 207 were constituted after 2003 and had a regulatory agreement that paid maintenance by square foot. 1067 out of 1074 are paying by “room count”, and 207 are paying by square foot. I obtained these numbers directly from information displayed by HPD in the aforementioned PDF presentation. What are the implications of paying by “room count”? Two apartments with the same “room count” number are now paying $525, but the smaller one would be paying $425, and the larger one would be paying $625 if paying by square foot. The difference may not appear substantial, or be relevant now, but as maintenance goes up with this agreement, the impact will certainly be much more considerable. Paying maintenance by “room count” evidently results in residents of smaller apartments subsidizing part of the cost of maintenance for larger apartments. This not only unfair, but also unsustainable. Smaller apartments are paying the same maintenance than larger apartments because they have the same “room count”. The practice of paying maintenance by “room count” results in a contradiction with the spirit of the principle: maintenance must be proportional to the size of the apartment. Evidence in support of this observation can be found by cross-checking charts in a building that is paying by room or by square foot: please see a sample chart showing maintenance calculation based on “room count” as appearing in the Offering Plan (Schedule A) for the building and another sample chart showing maintenance calculation based on square foot. For instance, a small apartment with the current “room count” calculation pays $525 but would pay $432 if paying by square foot; a large apartment with the current “room count” calculation currently pays $525 and will pay $606. I provided Mr. Mark Matthews (Asset Manager at NYC Dept. of Housing Preservation and Development HPD Commissioner) with the charts so he may review the cost differences. The first time I asked (Mr. Matthews and Mr. Jay Crespo from UHAB) about how rooms are counted for maintenance and the reason for half units such as 4.5 or 5.5, I was informed that each room counted as one and the bathroom counted as half. Looking at the plans, I felt that this was not a full explanation, which prompted deeper research on the “room count” issue. During the two-year course of my research, I looked at Schedule A in the offering plan of a building and I looked at the plans of that building before and after renovations. I can say with certainty that there was a match to the “zoning rooms” after renovations in the plans that I obtained from the Department of Buildings and the “room count” in Schedule A that that building was using to calculate maintenance. After the meeting with the DOB commissioner who clarified that “zoning rooms” don’t measure space,” I went in a different direction, looking again for the definition of a “room.” After another year of further research, I made a major discovery: room is defined by its intended use or purpose. In a minute (1:44) in the video mentioned at the beginning of this text, Mrs. Hendrickson confirmed that, “as stated under Article 11, HPD has only the authority to approve the formation, the dissolution and changes in the certificate of occupancy.” Mr. Matthews had already told me the same – that HPD can no longer regulate the buildings that are formed as a corporation, and that, although they know that the policy is wrong, they cannot impose that regulation. I pointed out to Mr. Matthews that HPD could send a letter to the buildings, acknowledging that HPD used the wrong criteria to calculate the “room count” and attach a recalculation of the “room count” in all HDFCs, making sure they know the right criteria. I was told HPD wasn’t interested in doing anything in this regard at this time. Since HPD is currently writing a new regulatory agreement that affects these buildings, now is the time to act to close the old gaps. HPD can actively propose and change the policy to pay maintenance by square foot. The new regulatory agreement requires a mandatory 2% yearly increase. The new agreement involved more expenses for the building, including hiring a manager and a monitor. With cap prices, the profit in the sale, even with high flip taxes will be much shorter than in the past (a jump in a figure it will not be expected). Since maintenance is going to go up, it is time to adjust the criteria for payments and make it proportional to the size. Please include a proviso in the regulatory agreement to extend the current HPD policy of paying maintenance by square foot that was applied in 2003 to all HDFCs. Gap 2 – A provision that brings stability in the cooperative and set the maximum on maintenance increases and that will prevent luxury items being mandatory even when approved by majority. This Regulatory Agreement puts into place an entirely new set of policies from those that already existed. This will break the equilibrium and bring conflict to the buildings until at least several gaps are filled. New Policies will result into a demographic and class inversion of the affordability. In several public presentations, when the question of “why this agreement” was raised, I have heard Mr. Bagget (acting as NYC HDFC)  once and again explaining this theory: this new agreement will push the lowest in the spectrum of low-income HDFC to sell and highest of the spectrum to stay or to buy because that is exactly what this agreement is designed to do. I don’t think Mr. Bagget labeled this theory, but what his theory suggests is that this agreement is about “moving” affordability. (I want to give Mr. Bagget credit for his theory.) If the agreement is not designed to move affordability, but this is the effect by default, then several points have been overlooked and need to be revisited. If, indeed, this agreement is designed to convince residents to sell, what is the reasoning behind it? Regardless whether or not the demographic and class inversion of the affordability are the default actions or things that are intentionally sought, I am trying to envision the consequences if the changes are in place and propose other alternatives to mitigate the disequilibrium that this proposed agreement will create in HDFC’s coops. For a long stretch of time, with the huge increase in the market up to 2008, the profit was very high and the flip taxes were used to cover a lot of the buildings’ operations cost. With the big recession in the U.S. in 2007, the evolution of prices was inverted, and apartments sold for less than what they cost earlier with no profit. Although the prices have been returning to where they were in 2007, the prices are close to the point they were, so people that bought during a ten-year stretch are selling at low profit. The lack of profit in sales has caused a general increase in maintenance between 2007 and 2016. Even when the flip taxes go up to 30% with the new agreement (much larger than current in many buildings), the amount that the buildings get will be smaller than now because the profits with capped prices will be small. By putting a limit on the maximum sale of the price cap prices, the profit will be very low or none, and the flip taxes will no longer be a significant source of income for the buildings. There is, however, an exception to this. As it is proposed now, the profit on the sale will be significant for the corporation if it is the original tenants who are selling (because they bought for $250 and expect to sell for $250,000) or if it is the shareholders who bought in the middle when the prices were low. Those shareholders will be in a difficult situation, being too much of a target for potential exploitation. To get too much money from some of the shareholders from the flip taxes can bring predatory practices inside the corporation (to avoid exploitation, don´t create supra-profitable conditions). Greedy Boards might push those shareholders out to get income. On the other hand, for those shareholders who bought at the high of the market, and with a mortgage, the sale will imply a sure loss. For instance, if they borrowed $300,000, they have to pay to the bank, with interest, about $600,000 (well under the cap price). These are ones who are going to stay in the building and try to get amenities to improve their living. Innovations and renovations are decided with a simple majority vote. Those in opposition have to pay for the renovations they don’t want, don’t need and can´t afford. When maintenance goes up, the lowest spectrum of the low income will not be able to afford to live there. The fact that those who bought at high prices will lose equity in the sale, and those who bought at low prices will not be able to afford improvements (and the fact that the corporation will get a huge fee from sales because of the new policy of 30% flip taxes) might prompt different practices, such as a hold over procedures to push out those who bought at low prices. A hold over procedure can be placed when the Board believes that one doesn’t belong to the community. Shortly, the lowest spectrum of the low-income shareholders will not belong to their community. It will be profitable for the community (now composed of the highest of the low-income spectrum) that they are not there, and that they sell. If this agreement is not designed to push the lowest income in the spectrum of low-income shareholders to sell (as Mr. Bagget argues), then several provisions need to be in place: a provision that brings stability to the maintenance increases (including a provision about renovations that will prevent luxury items and improvements from being mandatory even when approved by a majority), a provision for a maximum of maintenance increases and a provision forbringing income to the building that doesn’t rely on the shareholders’ leaving (income through high flip taxes). Gap 2 – A provision that brings stability and set the maximum on maintenance increases and that will prevent luxury items being mandatory even when approved by majority. With this new regulatory agreement, HDFC apartments will be obligated to a minimum maintenance increase of 2%; but there is no provision in this new regulatory agreement that limits how much maintenance can be increased. To not have a minimum or a maximum increase is appropriate in a scenario in which the corporation is independent and not regulated, but not in a corporation that is becoming much more regulated now. In the video, Mrs. Hendrickson said “somehow within the line of rent stabilization.” Obligated to a minimum maintenance increase of 2% is not in the lines of rent stabilization but in clear opposition of rent stabilization. Whether or not in rent stabilized buildings the increase in rent is set by the city as the maximum percent, in HDFC, the increase in rent will be set by the city as the minimum percent. Even though the percentage is on the same lines (2%), the spirit is in contradiction because in HDFC, it will be the minimum of how much the maintenance should be increased but there will be not a maximum in how much the maintenance can be increased. It has been a switch in the shareholders and this will continue to happen even more because of the new regulatory agreement. People with different incomes and experiences have different expectations (this is the way Mr. Bagget framed this issue). I will add that expectation is not only related to being the original tenants but also related to income. I can speculate that shareholders who were the original tenants, and shareholders who have lived in rent-stabilized apartments before, are those on the lowest-income side of the low income spectrum. And I can imagine that, for those, the priority is to have major services – for instance, hot water and heat. And that for those in the highest-income side of the low-income spectrum the expectation involves owning their icon home – they are looking into amenities and luxury items that they deem necessary. It must be a provision to protect the lowest spectrum of the low income so they are not priced out and forced to sell when the majority of the building wants to do some fancy renovation that they consider a necessity. A roof garden, centralized Wi-Fi or a cooling-system are samples of non-necessary items that are not reasonable. An elevator and a ground floor garden are samples of non-necessary items but reasonable. A repair in the roof that is leaking is mandatory. When dealing with cooperatives in other countries, the situation is regulated. Even though all residents may enjoy the improvements that take place, those in opposition to the improvements don’t have to contribute to them. This will create stability in the maintenance, which will be governed by need and not by wish. There are other strategies as the wealthier sponsor the cost of the amenities in exchange to being accepted into the coop (proposed by Mr. Bagget). If the well-off want to sponsor improvements, and the improvements are reasonable, there should be no opposition. No one should be pressured to pay for something isn’t needed. Include a provision that states that no shareholder can be forced to contribute to the cost of improvements and that renovations that are not necessary, (even if the renovations are an improvement for all residents), must be (even when approved by any majority) only covered by the voters in favor. Flip taxes are a percentage of the profit (% of the sale payable by the seller to the building when selling). As it will be with The Agreement even though the percentage is a flat percentage, the profit for the sale varies substantially from nothing to several hundred thousand. The profit for similar apartments will go from $0 to $300,000, and when the flip taxes are high, the percentage of the profit will be substantial. With the proposed flip taxes of 30% in the agreement, and because of the previously noted specific circumstances, the sale of some apartments will be highly profitable and the sale of others, similar apartments will be not profitable for the building. The sale of the same apartment may bring $100,000 to the corporation and another may bring $0: in this scenario, the corporation will win a lot if “certain” shareholders leave. Flip taxes are a delicate matter because they imply a clear conflict of interest: the corporation wins and the shareholder loses. For that reason, many existing HDFCs have agreed to a lower flip tax (10% to 15% in many cases). These low flip taxes help to avoid situations in which the corporation will make a lot of money, because “certain” shareholders leave. One might found oneself in a position that one sale is never approved, or that one is pushed to sell, or that one is exploiting one’s neighbor to be able to have healthy finances. A flat flip tax of 30% sets a scenario where conflict and predatory practices will flourish. This sliding scale will equal the amount that a building gets per share and ensure equilibrium so as not to have a real advantage of some people selling. In the aforementioned presentation (video minute (12:39), the sliding scale of the tax exemption is addressed. If the tax exemption has a sliding scale, why are the flip taxes flat? I believe that there is a lack of thought on the implications of what 30% of the flip taxes will bring. As it is now, the corporation has one source of income (that is not coming from shareholders): the market (the assets that one has become more valuable). The market made it possible for both the leaving shareholder and the corporation to win with a sale. The agreement is missing a provision to create income that is beneficial to the corporation and the leaving shareholders. The lack of limit in the price of the sale was doing exactly that: making a common ground in which it was beneficial for the shareholder and for the cooperative to sell at high prices. With the new agreement, a sale will imply a huge contradiction of interest: it will be good for the cooperative but bad for the leaving shareholder. As it is now, with no cap on the sale price, a sale is both beneficial for the corporation and all its shareholders, with no major loss for the shareholder leaving (in co-ops with low flip taxes of 10 to 15%). From the business point of view, the model of the new agreement is a failure (one wins only because the other loses). Any member being part of any corporation should expect that the benefit of the corporation is not in complete opposition with his own benefit, even when leaving. At minute 13:31 of the video mentioned above, Mrs. Marie Hendrickson discusses that when flip taxes are introduced as 30% of the profit, “it can benefit the building [and] the shareholders.” However, is it only for benefit of the shareholders who remain and in clear obstruction of benefits for the shareholders who leave. Mr. Gregory Bagget (acting as NYC HDFC) held several educational sessions, specifically the NYC HDFC TEACH-IN Visioning Regulation and Reform that took place at 215 West 125 Street Conference Room, Third Floor between July 11 and July 18 2016. These sessions were designed to convey the history of the HDFC and the laws that regulate it. Oversight 2 –Exclude a provision about putting a cap price sale on apartments if mandatory flip taxes % is kept. No double restriction on the sale, in the price and in the profit. This Regulatory Agreement overlooked the fact that an HDFC is a corporation regulated by the Business Corporate Law (BCL) and that equity and independency is expected. Whether an equilibrium might be necessary for increasing prices in recent the market, the double restriction of profit imposed on the seller both through a cap on the selling price and the corporation holding a 30% profit is excessive. The figure of the monitor to approve the sale made the shares non-transferable. This begs the question: is the agreement about preserving ownership or suppressing ownership? This new agreement places a cap price on the sales of the apartments and flip taxes of 30% – both mechanisms reduce the potential profit for the seller substantially. Being a corporation profit is expected. Being an HDFC, a business but still affordable housing, it is understood that there can be room for control but not to the point that results in losing doubly in the profits: The profit is now doubly suppressed by the cap price and by the increased to 30% flip taxes. There is equilibrium between at-risk affordable home ownership and the removal of the ownership from their owners. Anybody buying equity in a corporation is buying shares, not objects (apartments or any other object). There is a contradiction in putting a limit on the price of an apartment by its bedroom with a corporation owning shares, not apartments. In any corporation, and so in the HDFC, subsequent buyers bought under the expectation that the shares would increase in value. This new regulatory agreement placed the limits against reasonably increased assets. Those who bought a few years ago under certain conditions, will see that arbitrarily and without warning HPD is changing the terms of purchase by overwriting the By laws. The two financial variables that determine the price of an HDFC coop in New York are the market price and the flip tax that the building has in their by-laws. Whether the market price is something that one can expect to go up and down and it is an assumed risk by a prospective buyer, there was no regulation for limiting the price of the transfer of shares; it is only a limit on the income of the buyer. Whether the flip taxes is something that the cooperative can alter with 2/3 of the votes, the amount is determined by every cooperative and there is not mandatory flip taxes. These two variables will be soon altered by HPD. HPD haven´t informed in the last thirty years in the risk of losing expected equity or devaluating HDFC as assets, neither in the upcoming alteration of the conditions under which the sale was placed. The new agreement implies that the monitor approves the sale. The monitor shouldn´t approve the sale but rather watch the process of approving the sale by the Board. “The sale must be approved by the Board and the monitor…” appeared in the presentation. A monitor by definition is something to expose or somebody that watches over. “The sale must be approved by the Board and the monitor” explicitly gives authority to the monitor to approve, while taking away the authority of the Board to decide. But a monitor, by definition, has no authority to decide. In this sentence, the so-called “monitor” is acting as a Board since in a corporation the only one approving is the Board. An HDFC is a corporation and there are sales that are transferable. These sales need to be approved by the Board. “The sale must be approved by the Board and the monitor” (included in the new regulatory agreement) overlooks the authority of a Board. This point I left short (not because it is less important – quite the opposite) equity and independence is possibly the most important problem of this regulatory agreement. I am well aware that Mr. Baggett from the NYC HDFC and the HDFC Coalition are going to be discussing this issue extensively. As I said, recently I have been volunteering for a few evenings to prepare the NYC HDFC TEACH-IN Visioning Regulation and Reform. I went to the presentations made by Mister Bagget. During the presentations, it appeared clear that giving the monitor the ability to approve was equivalent to the shares not being transferable, which is in clear contradiction of the Business Corporation Law under which HDFC are constituted. This is not a point that I realized but something that was stressed by Mr. Baggett and it was the point that everybody among the attendees was clear about and in clear opposition to. In a matter of months, many people who bought under a certain agreement and in certain conditions have to face a turnaround in the way they live. They were expecting stability until 2029, but now thirty thousand individuals will have to change the way they live. Taking damp taxes out as a way to force people to sign the regulatory agreement is a clear way of forcing into regulation. This goal has also been explicit in the afore mentioned presentation Preserving At-Risk Affordable Home Ownership: HDFC Coops and Our Community. But what is the point of forcing into regulation? The agreement is done under the threat of taking away a tax exemption that doesn´t expire until 2029. Why the rush now, when there are thirteen years left? Perhaps these two questions are interrelated. HPD says that “preserving” affordability is what is behind. But perhaps it is not. Perhaps the goal of the agreement is “moving” affordability: to force shareholders into a regulation they don´t want – so they sell. What is behind convincing to sell? In any case, whether this forcing is done for political reasons (i.e., forcing the regulation with the expectation that the people sell, making apartments available in HDFCs. These new units will be counted as new “affordable housing units.” The “units” will change hands no new unit will be built.) or for other reasons (e.g., to help HDFC with distress) the effect is the same: in a very short time (out of the blue) the residents of HDFCs will have to change the way they live. No preservation campaign can be done on the rush and with force. Introduce the agreement from the positive point of view: offering it to those who want to join and granting at least a five year period so current HDFC residents can adapt to the new situation. 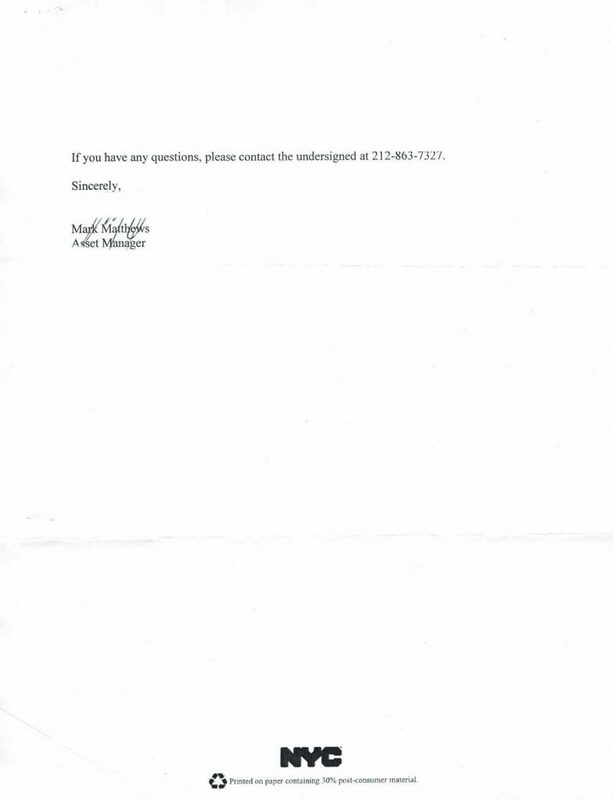 The observations were sent to Mrs. Anne Marie Hendrickson,Deputy Commissioner for Asset and Property Management, New York City Department of Housing Preservation and Development on September 20 2016 via e-mail and via mail (with additional information) to Mrs. Vicki Been, HPD Commissioner New York City Department of Housing Preservation and Development on September 27 2016. 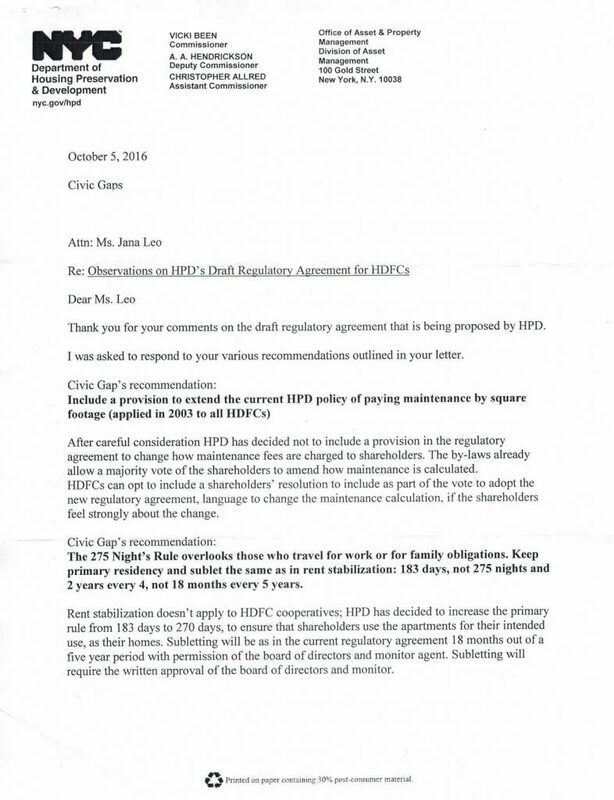 One of the responds in Mister Matthews’s letter is that “there is no reason to introduce this (are not willing to revisit the wrong room count into the agreement because the Board can change it “After careful consideration HPD has decided not o include any provision in the regulatory agreement to change how the maintenance fees are charge to shareholders. The by-laws already allow a majority vote of the shareholder to amend how maintenance is calculated. HDFCs can opt to include a shareholder’s resolution to include as part of the vote to adopt the new regulatory agreement, language to change the maintenance calculation, if the shareholder feel strongly about the change”.The board HDFCs has also the capacity change (the cap sale prices or not to cap sale prices, as well as to choose the flip taxes percentage, and to lower their AMI that can fluctuate under a 165% limit). Being consistent with Mister Matthews’s of not regulating anything that the board have capacity to regulate, will made an argument for HPD not regulating cap sale prices or flip taxes. Every building by their by-laws has the option to regulate all other matters regulated in stone by this agreement such as the flip taxes, cap prices and form of management. HPD is overwriting the by-laws in certain things and not on others what is not consistent. It is clear that HPD feels no obligation to be consistent; But in my view nobody has the right, even when the power to do things randomly to their convenience. Rules of the City of New York – Title 28 Housing Preservation and Development . Room Count. “Room Count” shall be calculated in the following manner: Each dwelling unit with at least one room which either (i) contains no cooking facilities and measures at least one hundred and fifty (150) square feet, or (ii) contains cooking facilities and measures at least two hundred and thirty (230) square feet, shall count as two and one-half rooms. Every other room in the dwelling unit separated by either walls or doors, including bedrooms, shall count as an additional room, plus one-half room for a balcony, provided, however, that kitchens, cooking facilities, bathrooms or corridors shall not count as an additional room. Furthermore, HPD when calculation the room count of apartments, failed in their obligation to made sure that the facts stated in Schedule A of the certificate of incorporation were correct. Let me note that I see here a the lack of care; Mister Matthew told me that HPD didn´t visit the apartments, neither measure the rooms, he added “we were selling the apartments for $250 how can you expect that we measure anything”. In addition, HPD, knowing the “room count” was problematic, changed the criteria to pay maintenance from room count to square foot in 2003 and introduce this change in the regulatory agreements. If HPD is thinking in improving the functioning of HDFC, would be only natural to correct the mistakes that HPD did (for what ever reason) and to made sure that maintenance is paid in a fair way, following the principle that maintenance should be calculated the size of the apartment. It is natural to made mistakes when starting a new program model as the HDFC but still what is done wrong is still done wrong and as is a lack of responsability to avoid addressing past failures. Mister Matthews told me that no shareholder commented in the “room count” issue before, and assume that everybody was happy the way it was and that if I wasn´t happy I should sell my apartment and move some where else. I have got the same response a few years a go by my landlord when I complaining after being attacked in my building for having a non working main door lock. My landlord told me that if I don´t like the conditions I should move. And I moved to a coop building, owner operated, not expecting to have an HPD employee to give me the same recommendation that my slumlord: “If you don’t like move”. Mister Matthews told me that nobody complain about using the improper criteria to calculate room count and maintenance, perhaps there are not many forensic research with degrees in Architecture living in HDFCs but HPD is aware of the “room count” this is why Mister Matthews told me that in 2003 they changed the way maintenance was calculated from “room count” to square foot. Once HPD is aware of the issue, HPD must remediate what they did and address the issue. What is the argument not revisiting the “room count” now that HPD is proposing a new regulation for? If the argument is that HPD don´t want to revisit this issue in the new agreement because is something that the board can change by 2/3 vote, Why to revisit in this agreement any other issue that the board can also change rewriting their by laws? It doesn’t made sense, is irrational. I don´t think a government agency have the right to act irrationally. 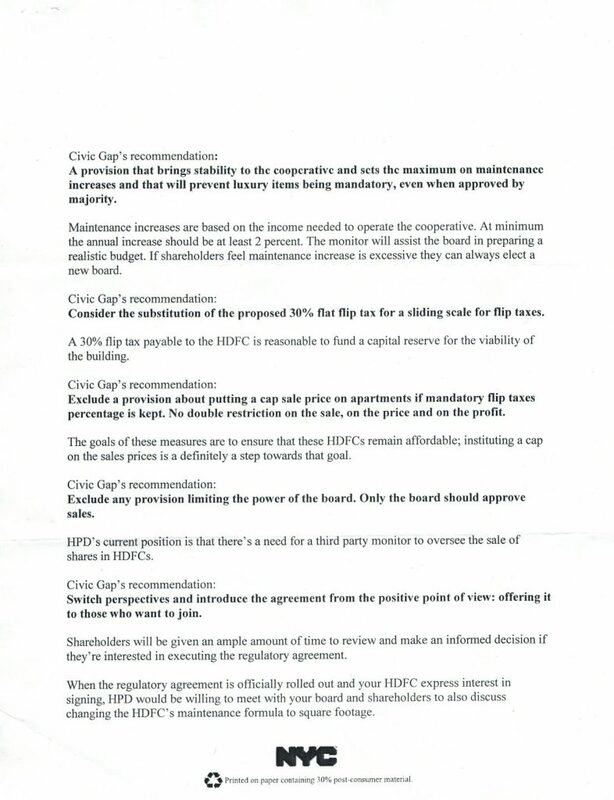 If this agreement is passed, maintenance will go up and people will not be willing to pay more maintenance than they have to pay (following the principle that the amount refers to the size of the apartment) the issue will be important enough for shareholders to look at the roots of the problem and HPD will have to respond an assume their responsibilities. HPD suppose to be fixing problems including the problems they created, instead of expending citizen resources trying to hide a wrong doing that they don´t want to recognize publically. In the letter that Mister Matthews sent me, HPD doesn’t address the problems that this agreement will bring inside the cooperatives and that are analyzed in the several pages letter I sent. 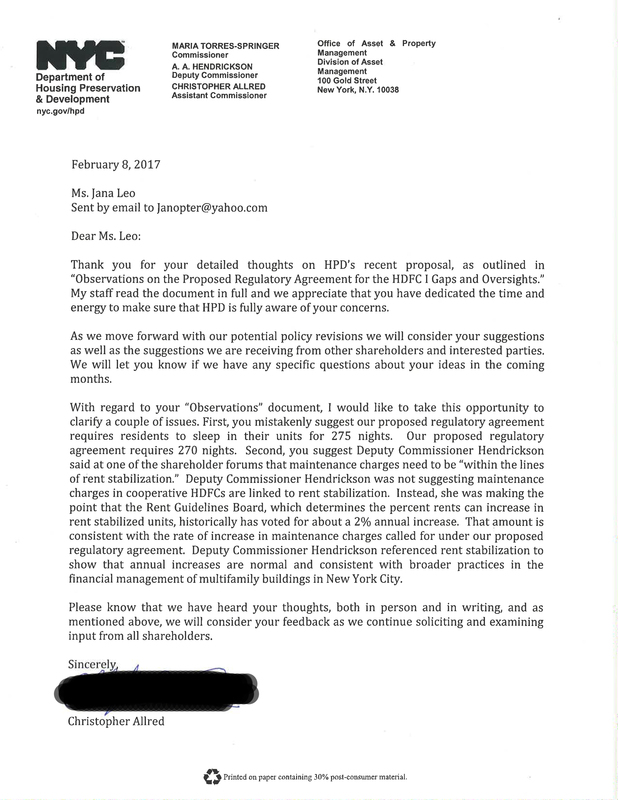 There are multiple contradictions in the letter, when referring to additional primary residency requirements for HDFC (275 nights of sleep instead of 183 days of occupancy) Mister Matthews says “Rent stabilization doesn’t apply to HDFC cooperatives”. In contrast, in a recorded video presentation, you (Deputy Commissioner for Asset and Property Management, Anne Marie Hendrickson): Preserving At-Risk Affordable Home Ownership: HDFC Coops and Our Community that took place July 21st, 2016, at the Manhattan Borough Board Meeting, you are referring to rent stabilizes as the reference for the agreement. For instance in the video you ( Mrs. Hendrickson) said “somehow within the lines of rent stabilization” when taking to minimum maintenance increase of 2%. So you uses rent stabilization as a reference model but then changes the requirements from Primary residency and rent-stabilized apartments that is 183 to 270 and Sublet 2 years every 4 as in rent stabilized apartments to 18 months every four years. It is obvious that a HDFC is not a rent-stabilized apartment but then why you (Mrs. Hendrickson) take it as reference for one aspect and not for the others. Again, I see the same problem, inconsistency. It is clear that HPD feels no obligation to be consistent, to follow a logic or to analyzed the consequences of their policies on people. How can HPD can be trusted to create an agreement when HPD is constantly inconsistent? This letter is a good mirror of HPD position: HPD feel that they can impose what they want without a practical plan or arguments in favor. HPD feel in power. HPD wants what HPD wants. I am asking for accountability. Mister Matthews’ October 5, 2016 letter offers no arguments but mere affirmations; there are contradictions and inconsistencies between what you (Mrs. Hendrickson) said in your presentation and what is stated in this letter. Mister Matthews’ letter disregard my serious analysis and doesn’t address the problems that this agreement will bring to cooperatives, that are clearly underline in my observations to the agreement that HPD is proposing for HDFCs. And, in that, acts a mirror of HPD position. I am asking for a serious reading of my analysis Observations on the Proposed Regulatory Agreement by HPD for the Housing Development Fund Corporation (HDFC) I Gaps and Oversights (posted at http://fundacionmosis.com/CivicGaps/) and serious response from an HPD official.